A Letter from Bernice A. 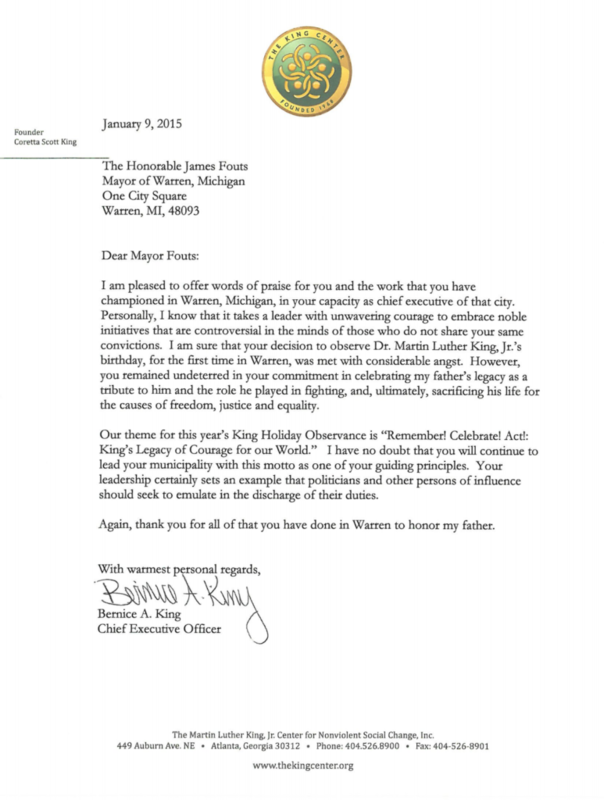 King to Warren Mayor James Fouts thanking him for his tremndous efforts honoring the Legacy Of Dr. Martin Luther King in the City Of Warren. 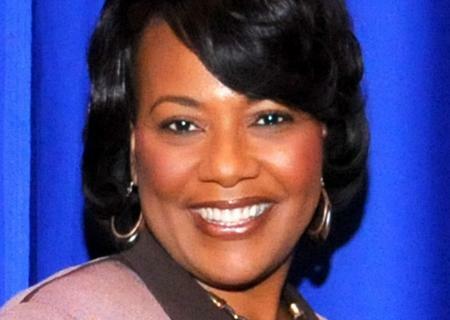 I am pleased to offer words of praise for you and the work that you have championed in Warren, Michigan, in your capacity as chief executive of that city. Personally, I know that it takes a leader with unwavering courage to embrace noble initiatives that are controversial in the minds of those who do not share your same convictions. I am sure that your decision to observe Dr. Martin Luther King, Jr.’s birthday, for the first time in Warren, was met with considerable angst However, you remained undeterred in your commitment in celebrating my father’s legacy as a tribute to him and the role he played in fighting, and, ultimately, sacrificing his life for the causes of freedom, justice and equality. Our theme for this year’s King Holiday Observance is “Remember! Celebrate! Act! King’s Legacy of Courage for our World.” I have no doubt that you will continue to lead your municipality with this motto as one of your guiding principles. Your leadership certainly sets an example that politicians and other persons of influence should seek to emulate in the discharge of their duties. Again, thank you for all of that you have done in Warren to honor my father. The Martin Luther King Jr. Center for Non-Violent Change, Inc.
← Warren Mayor James Fouts recently attended what should have been a joyous occasion for the City of Warren’s 4th annual Dr. Martin Luther King Jr. ceremony.